In the previous two posts, we have seen that in the late 1800s and early 1900s, population grew most quickly in major metropolitan city centers. Then the area of fastest growth migrated to the suburbs, and eventually to the exurbs. One of the results has been an increase in the size of urbanized areas. At right is a graph that shows the growth of the size and the population of 39 major metropolitan areas in the United States between 1950 and 2010. The blue columns represent population growth, the red columns represent growth in the land area of the metropolitan area. In 2010 the total size of these 39 metro areas was five times as large as in 2010. (40,207 square miles in 2010 vs. 7,924 in 1950) For 32 out of the 39, land area grew more than population, and for only 7 did population grow more than land area. Growth in land area in the context of a slower growth in population is called sprawl. In the graph, the metropolitan areas are ranked by the ratio of the land area growth to population growth, with the largest ratios to the left. In Missouri, St. Louis and Kansas City are represented. Both areas have been slow growth areas, but land area has nevertheless grown more quickly than population. In St. Louis, urban land area grew by 305% (a quadrupling in size), while population grew only 54%, a very high sprawl ratio of 5.7-to-1. In Kansas City, urban land area grew 355% while population grew 118%, a moderately high ratio of 3.0-to-1. I used the MABLE/Geocorr engine at the Missouri Census Data Center to generate urban-rural data for 2000 and 2010. In those 10 years, urbanized area grew from 1,818.75 sq. mi. to 2,054.26 sq. mi. While this represents only 3% of total Missouri land area, it also represents an increase in urbanized land of 13%. Over the same period of time, Missouri’s total population grew by 7.1%, and its urban population grew by 8.6%. So why does any of this population and land use data matter environmentally? For two reasons. First, as I noted in a previous post, people consume stuff to meet their needs. As population increases, more stuff gets used, and more environmental stress is created. Second, land in its natural state provides environmental services that are necessary for life. But when land gets transformed to urban land, it loses some or all of its ability to provide those services. What are these services? Things like absorbing stormwater and thereby reducing erosion, metabolizing some types of pollutants, and photosynthesizing carbon dioxide into oxygen. The Environmental Protection Agency has just released a new report exploring the environmental impacts of land use, Our Built and Natural Environments. It is an impressive document, surveying a huge body of scientific literature. It asks whether our land use and transportation decisions affect the environment. In coming posts, I will explore land use in Missouri further, and what its effects on the environment are. 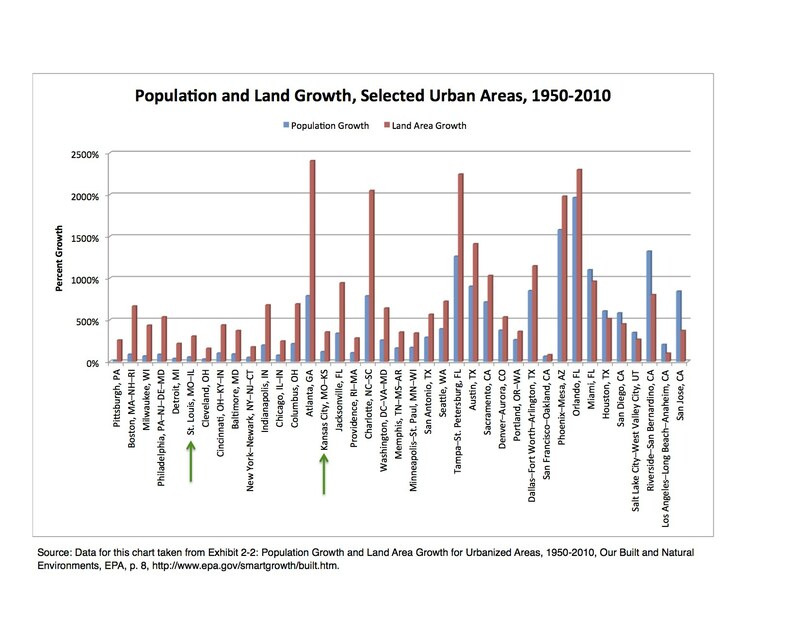 For the changes in land area and population of 39 metropolitan areas: Our Built and Natural Environments: A Technical Review of the Interactions Among Land Use, Transportation, and Environmental Quality, Environmental Protection Agency, http://www.epa.gov/smartgrowth/built.htm. MABLE/Geocorr2K: Geographic Correspondence Engine with Census 2000 Geography, Missouri Census Data Center, http://mcdc2.missouri.edu/websas/geocorr2k.html. MABLE/Geocorre12: Geographic Coresspondence Engine with Census 2010 (and later) Geography. Missouri Census Data Center, http://mcdc.missouri.edu/websas/geocorr12.html. By mogreenstats in Land on 2013/08/15 .